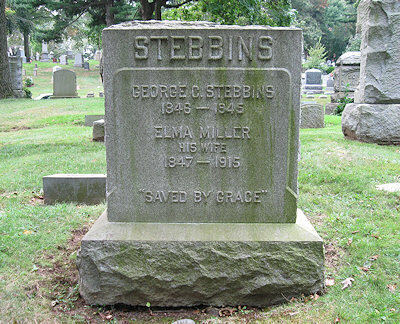 Maple Grove Cemetery, Kew Gardens, Long Island, New York, U.S.A.
George Stebbins (1846-1945) was an American Gospel hymn writer who composed the music for such familiar hymns as "There Is a Green Hill Far Away," "Ye Must Be Born Again," "Take Time To Be Holy," "Have Thine Own Way, Lord!" and "Saved by Grace." 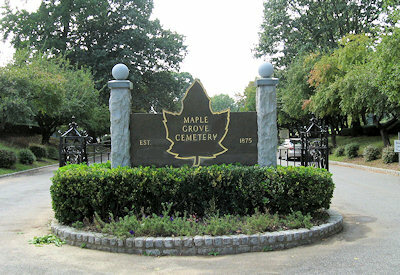 Main Gate, Maple Grove Cemetery, Est. 1875. 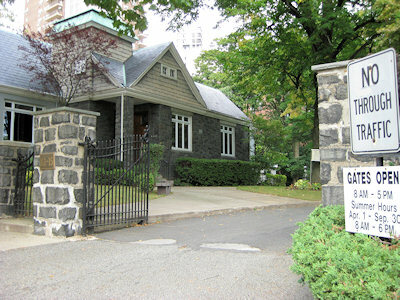 Kew Gardens, Long Island, New York, U.S.A.
Stop at The Center for map and directions or Email Cemetery prior to visit. Stebbins grave is located in the 4th row of Lots from the road. Monuments near Stebbins include Hunter and Briggs (with angel on top). Charles F. Young is to right of Stebbins and Rev. John Currie is to left. The inscriptions on the monuments for Currie, Stebbins, and Young face away from road. Photographs by Stephen & Dorothy Ross for WholesomeWords.org 2013.